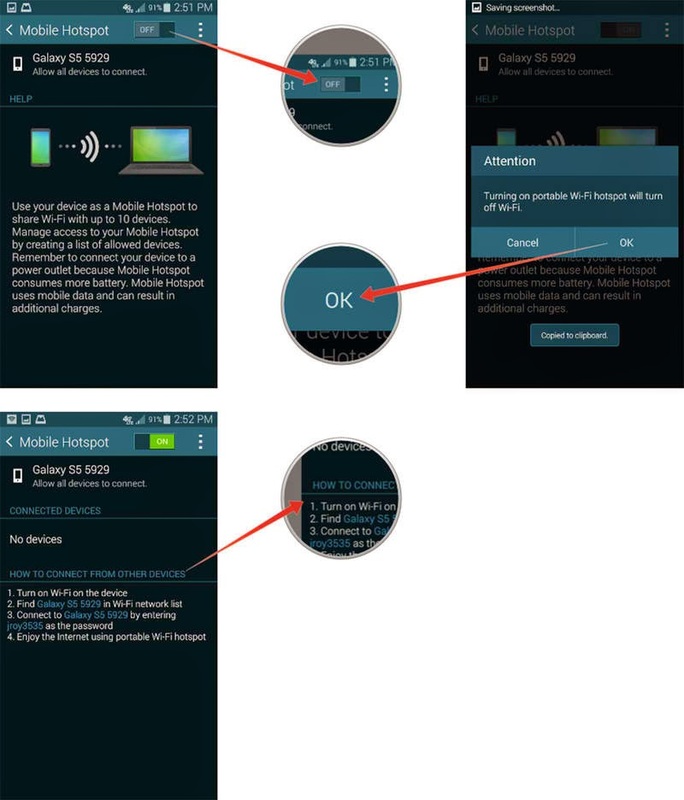 This article contains recommended solutions to a problem on Samsung Galaxy S5 that is unable to tether over a USB cable. With tethering feature active, owners of the Galaxy S5 handset are able to create and share an internet connection with a laptop or desktop computer. In order to do so, the tethering feature must be enabled on the phone. "Trying to share my S5's wireless Internet thru tethering but I cannot connect to mobile data connection with a computer over a USB cable attached to my Galaxy S5. I don't know what went wrong." · Tethering feature is not supported in your plan. · Drivers for USB tethering are not available and need to be installed. · Tethering via USB function is disabled or turned off. · Use of dysfunctional cable. 1. To make sure the problem is not caused by any account issue, please verify your account status and ensure it is in good standing with your carrier. Also check if you have the correct data plan. Additional Tethering/Hotspot plan is usually required by most mobile service providers. Verify if your service provider has the same requirement for your account to use tethering. 2. In case your computer lacks necessary USB drivers, install them first so you can proceed with tethering your mobile device to your pc. Majority if not all drivers will just install automatically. If not in your case, please contact Samsung technical support or simply visit Samsung website to get online support instead. Just look for Manuals & Downloads under Samsung Support page to start downloading drivers for your device. 2. Touch to select Settings to continue. 5. Touch Mobile Hotspots (or Tethering and Mobile Hotspot then Mobile Hotspot on other device). 6. With a functional USB cable, connect your phone to your computer. Use only the USB cord that comes with your phone to avoid any conflict. 7. Once both devices are connected, touch USB b to mark the checkbox and activate/enable the feature. Once enabled, a green check mark shows up. You should now see the USB tethering icon at the top portion of your screen. This means you may now share Internet connection on your devices. Be sure to clear the checkbox or disable tethering feature by tapping on the USB tethering option once you're done sharing your connection. And don't forget to disconnect the USB cable of course. · Try to connect using a different USB cable (if available). If tethering works with other cable, then the problem is on the original USB cable, which means you have to replace it. · Try to connect to a different PC (if available). If tethering works with other PC, then the problem is most likely on the current computer. Therefore you should use another functional computer instead. 1. Connect your phone to a computer. * Open the cover at the bottom of your handset. * Connect one end of the data cable to the socket and the other end to your computer's USB port. 2. Turn on Tethering on your phone. * Slide your finger down the screen, from top edge to bottom. * Touch the Settings icon. * Touch Tethering and Wi-Fi hotspot. * Touch USB tethering until feature is enabled or turned on. (A green check on the box indicates tethering feature is ON. * Normally, your computer will automatically establish an internet connection with your phone (or vice-versa). * Once the connection is established, try to access the Internet from your computer.